Sado Miyabi-Ryu (meaning "flowing gracefully") was founded by Mizutani Soga, a Master of the Omotesenke school of traditional Japanese tea ceremony. Sado literally means "the way of tea" the word is usually translated into English as "tea ceremony". Master Mizutani was born in 1949 and has been studying tea ceremony since childhood. For the last forty years he has been promoting international cultural exchange through tea ceremony and has traveled to Russia, England, France, America, Korea and other countries to perform tea ceremonies. Master Mizutani is available to travel internationally to perform tea ceremony. 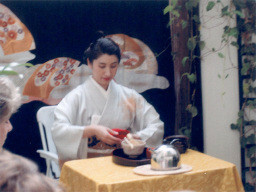 Tea ceremony can be performed at any location, including on board ships, indoors or outdoors, during the day or at night. Tea ceremonies are performed by Master Mizutani and his three assistants wearing traditional kimono, and include an introduction to tea ceremony followed by the ceremony itself, with music, authentic and traditional tea and Japanese sweets. We can make tea for up to thirty guests at one time, and can perform ceremonies to five times per day.